It’s a big time again for the biggest e-commerce players in India as well as their users. With the rising competition in the market, e-commerce companies are providing more and more discounts, attention grabbing deals and great to their users to catch their attention and drive more sales. You will be excited to know that Flipkart and Amazon have back to back huge sales in this month only. The companies have declared special sales in the upcoming weeks of the May. There will be lucrative offers and deals on the purchase of various products like mobiles, clothing and accessories, appliances etc. Both of these sales are going to add a huge percentage in the statistics of online shopping in this month. Amazon will be offering “big savings” on a various brands like Puma, Adidas, Sanyo and Levi’s. It will again be a “Great Indian Sales” scheme. The sale will be from May 11th to May 14th as per Amazon’s website. The company said, “Create your wish list now…top brands on sale from 11th – 14th May”. “Gear up for the biggest sale! 11th May will be all about big deals on big brands!” Amazon said on Twitter. 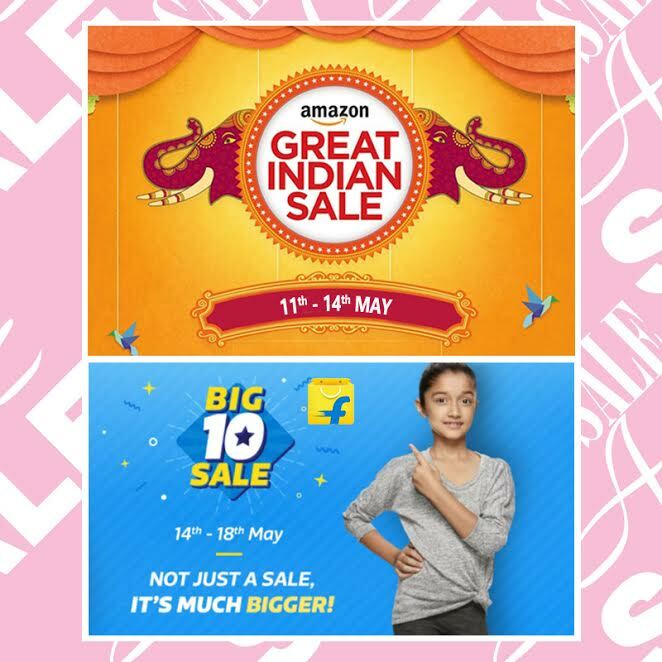 The Great Indian Sale of Amazon will be giving 60 percent discount on diverse range of products and global brands which include Motorola, Samsung, Philips, Adidas, LG, Levi’s, Puma etc. It also comprise of Indian brands like Prestige, Bajaj, Voltas, Fastrack and Bombay Dyeing. Coming to the Flipkart’s “Big 10 Sale” Sale, it will offer discounts on TVs and other appliances, fashion products, mobiles, electronics, furniture etc. The sale is going to be held from May 14th to May 18th. The company said, “Flipkart’s Big 10 Sale is not just a celebration of completing 10 years in the e-commerce space and being able to bring to you the best products online, but it is also a moment for thanking everyone for the trust conferred in us”. “…Flipkart is here with the biggest sale ever, from the 14th-18th of May, 2017, for products under every single category so that you get a chance to renovate and modernize all your everyday use and other items at the lowest prices online.” Flipkart’s Big 10 Sale will include brands such as Samsung, Apple, Sony,Vu, Lenovo, Panasonic, HP, Dell, UCB, Vero Moda, Levi’s, Puma, Adidas, Reebok, Micromax, Godrej, JBL and Nikon, among others, as per its website. Amazon and Flipkart will offer additional cashback if few shop via few specific credit/debit cards. The Amazon app said, “An additional 15 per cent cashback is being offered on purchases made on the Amazon app using Citi credit and debit cards, and 10 per cent in case of website”. Flipkart will offer a 10 per cent discount on use of HDFC Bank credit cards for purchasing items under the Big 10 Sale. Flipkart will also offer a 30 per cent cashback on payments made through digital payments app Phone Pe.